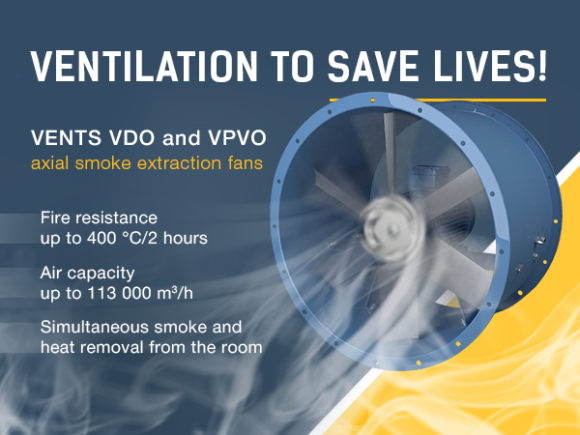 Introducing new smoke extraction ventilation products – the VPVO and VDO fans. The risk of fire is among the most important considerations for designers of public spaces –especially those used by large numbers of people. Designers and engineers have to make sure that the ventilation system whose primary task is providing proper air treatment also contributes to fire safety. While germs and other tiny contaminants which float in the air present a relatively minor immediate threat to human health, the carbon monoxide released during combustion has a much more pronounced and oftentimes lethal effect. Therefore, it is absolutely critical to keep exit routes free from toxic fumes. The VPVO and VDO fans are designed just for that kind of duty. The VPVO fans provide air pressurization. This basically means that the fan creates a positive pressure differential in pass-through areas such as stair landings, lift shafts, airlock entryways etc. This prevents smoke and other combustion products from penetrating the emergency escape routes ensuring a speedy and safe exit of all the occupants in case of a fire. The maximum air capacity of VPVO fans is 113,000 m3/h. In turn VDO fans extract the smoke which develops from a fire and removes excess heat beyond the confines of the serviced space or the building. The fan maintains smoke extraction efficiency while continuously extracting air with temperatures up to 400 °C for up to 2 hours and is intended for continuous air circulation in general ventilation systems. Just like the VPVO the VDO fans are characterised with a high air capacity which reaches 108,000 m3/h. A smoke control system is an essential structural element of any building, public or residential alike, as its main function is saving human lives in the event of a fire. VENTS TT-M: hybrid ventilation is go! The range of air handling units is expanding!